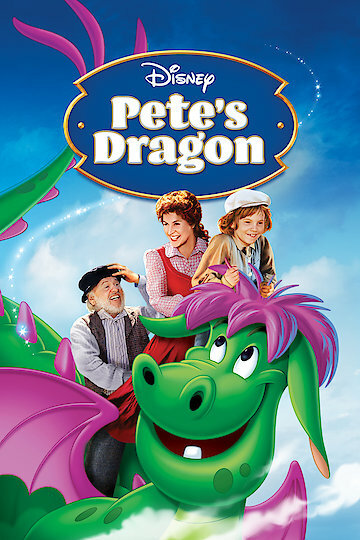 Pete’s Dragon is a fantasy film that is part live-action and part animation. It stars Helen Reddy, Mickey Rooney, and Shelley Winters. The film focuses on Pete, a young orphan who is escaping his abusive foster family. Pete meets Elliot, a magical pink and green dragon. Pete is the only person who can see Elliot. The two of them head to a village where invisible Elliot causes destruction. The village residents believe Pete is to blame and Pete is run out of town. Pete then meets Nora, a kind young woman who is helping her alcoholic father maintain the village’s lighthouse. Nora feels sorry for Pete and she invites him to stay in the lighthouse. Pete tells Nora about Elliot but Nora just thinks Elliot is an imaginary friend. Nora is no stranger to tragedy. Her fiancée, Paul, has been lost at sea for a year. Many people think that he is dead but Nora believes that he will come back to her. Elliot and Pete decide that they want to help Nora, so Elliot flies to sea to see if he can see Paul’s boat. Elliot finds him and Pete excitedly tells Nora. Nora doesn’t believe him and focuses on preparing the lighthouse for an upcoming storm. The storm is brutal and knocks out the lighthouse’s light. Nora is scared but Elliot then chooses to reveal himself. His flaming dragon breath is able to ignite the lighthouse light once again and Elliot’s actions save the entire village. Paul also soon appears back in the village but he is suffering amnesia and does not remember Nora. Elliot helps out once again by knocking Paul over. Paul bumps his head again and his memory returns. With everybody happy and safe, Elliot leaves and heads to help another child in need. Pete's Dragon is currently available to watch and stream, buy on demand at Amazon, Vudu, iTunes, YouTube VOD online.